The LifeBed hospital bed monitoring and notification system from Hoana Medical is approved for use in the EU. The system has two main parts: a bed coverlet, and a wall monitor. The LifeBed coverlet senses patient respiration and heartbeat as well as movement. It's a zip-on mattress cover with an embedded sensor array, including pressure switches. The wall monitor presents this information, and transmits it to the other communication systems in the hospital. Hoana's technology transforms any hospital bed into a LifeBed, which invisibly tracks a patient's basic vital signs without any connection to the patient whatsoever. 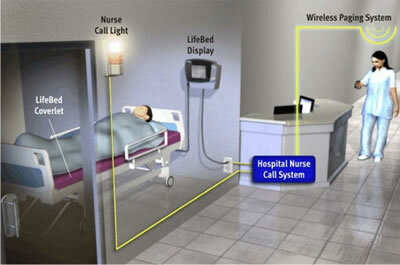 However, if the patient begins to deteriorate, the LifeBed immediately notifies the hospital nursing staff -- all invisible to the patient. It essentially provides "another set of eyes" to look after the patient. Apparently, this system has been tested extensively and is in wide use in this country. 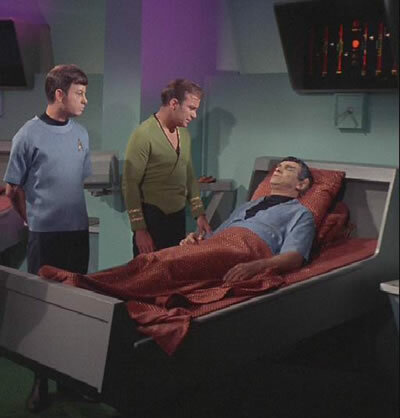 Star Trek fans (classic Trek, natch) recall the amazing sick bay beds that always knew everything about patients lying on them.